Jonathan Furst with Air Resource Specialists, helped design, build and install the monitor at the D Pad. Samples are collected and shipped to the lab, Eastern Research Group, by Garfield County Public Health staff. A first look at air quality impacts in Battlement Mesa from Ursa’s new oil and gas operations suggests there’s little risk, according to a report from Garfield County health officials to county commissioners on Monday. 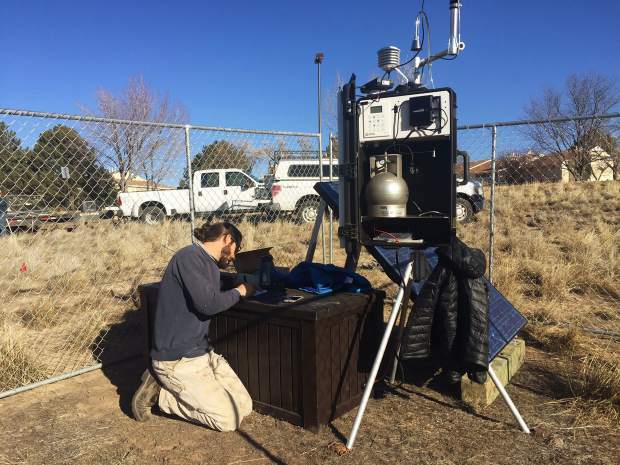 To better gauge air quality impacts from Ursa’s operations in the Battlement Mesa PUD, Garfield County Public Health contracted with Air Resource Specialists Inc. (ARS) to design and build a conditional sampler. It collects canister samples near Ursa’s newly developed D Pad. On Monday, Garfield County Environmental Specialist Morgan Hill presented some of the county’s first findings, indicating minimal risk in any of the samples. According to the data, all air concentrations of individual and combined volatile organic compounds (VOCs) were below long-term, non-cancer health guideline values established by state and federal agencies. VOCs are carbon-based and hydrogen-based chemicals that exist in the gas phase or can evaporate from liquids. Sources of VOCs include vegetation, various aspects of oil and natural gas development and production, and traffic. Seven of the 79 VOCs did not have health guideline values and therefore were not evaluated. Cancer risk estimates for benzene and ethylbenzene individually and combined were within the U.S. EPA generally acceptable risk range. Samples showed that the non-cancer and cancer risk estimates were similar both downwind and upwind, according to the report. Hill told the Post Independent the program started last March following the construction of the BMC D Pad. Hill called it one of the most unique and innovative air monitoring programs she’s seen. For the D Pad collection, the county implemented a conditional sampler to better collect data attributed to the nearby oil and gas activity. The data was collected using a stainless steel canister designed to collect ambient air samples when specific wind direction conditions are present. In order to collect samples directly influenced by well pad activities, the sampler opens on one of the canisters when prevailing winds come from the north. When the prevailing winds are from the south, the sampler opens on a second, separate canister to collect data not likely to be associated with well pad activities. For this study, each sample comprises at least a seven-day period to ensure sufficient collection for VOC identification. While other Garfield County air monitoring sites do not use conditional sampling, Hill said the county will continue to use it and improve it at the D Pad. Already, the county had made adjustments to the sampling techniques and installed a second sampler at the end of 2017, Hill said. While Garfield County maintains full oversight of air monitoring programs in the county, the new site at the D Pad is funded through a condition of approval for Ursa Resources’ Special Use Permit for natural gas development in Battlement Mesa. For more information visit http://www.garfield-county.com/air-quality.